significantly improving in range and accuracy. Such a breakthrough would provide the Revolutionary Guards with conventional deep and precision strike capabilities not only on the battlefield but also in the theater. Furthermore, Iran’s burgeoning capabilities are seriously challenging the Gulf’s existing missile defense architecture. Under these circumstances, the military strategic balance in the region should be revisited. On June 18, 2017, the Iranian Revolutionary Guards Corps launched surface-to-surface missiles from Kordestan and Kermanshah provinces, west of Iran, targeting ISIS positions in Deir ez-Zur, eastern Syria. Al Jazeera, Accessed on: June 21, 2017. Iranian sources reported a religiously symbolic code-name for the operation, Laylat al Qadr. Tehran Times, Accessed on: June 21, 2017. Top figures of the Iranian military and security establishment welcomed the missile attack. The Revolutionary Guards’ spokesperson, General Ramezan Sharif said that the strike was “only a tiny example of Iran’s punitive power”. Tasnim News Agency, Accessed on: June 21, 2017. More importantly, General Sharif hinted at the possibilities of more missile strikes as ‘crushing responses’. Tasnim News Agency, Accessed on: June 21, 2017. The Iranian Armed Forces Chief of Staff, General Mohammad Bagheri claimed that Iran was one of the biggest missile powers of the world. Tasnim News Agency, Accessed on: June 21, 2017. Missiles have a key role even in domestic political debates in Iran. Recently, during a rhetorical exchange with President Rouhani, the Revolutionary Guards did not refrain from portraying themselves a power not only with guns but also with missiles. Radio Farda, Accessed on: June 28, 2017. Amidst tension in the Middle East, the missile strike has both political and military importance. It came after terrorist attacks in Tehran, and military escalation between the US and the Assad regime in Syria. Even more importantly, it is revealing the trajectory of Iranian ballistic missile modernization and evolution. Thus, it offers a real insight into the future missile threat landscape in the region. Although there are some alternative explanations, most open-source evidence suggests that the Iranians’ missile of choice was the Zolfiqar, a solid-propellant Fateh-line derivative. Some Israeli press sources reported that a mix of Zolfiqar and Qiam – a Scud C derivative –, and even Shahab-3 missiles may have been used,Times of Israel, Accessed on: June 23, 2017. although the latter would be highly unlikely. Israeli press sources, most probably the closest monitor of Iran’s missile proliferation, told that the missiles, which hit Deir ez-Zur, flew around 800 km over the Iraqi airspace to strike ISIS targets in the city. According to the referenced sources, it was Tehran’s first operational use of medium-range ballistic missiles since the Iran-Iraq war,Haaretz, Accessed on: June 20, 2017. although the suggested range falls under the short-range category as it is below the widely-accepted threshold of +1,000km for medium range ballistic missiles. Nevertheless, Iranian sources suggested a shorter flight path of some 650 km from launch positions located in the west of the country. Fars News Agency, Accessed on: June 21, 2017. Tasnim news agency, an Iranian outlet with the Revolutionary Guards connections, reported that the missile strike was coordinated with the Baathist regime of Syria. Tasnim News Agency, Accessed on: June 20, 2017. In fact, this was an operational necessity not only because the Zolfiqar missiles were fired into the Syrian airspace through the Iraqi border, but also due to Assad’s forces’ (mostly besieged) presence in Deir ez-Zour. Assad’s forces are in a dangerously besieged position, encircled by ISIS elements. In the meanwhile, the ongoing regime operations have been pushing for linking up the besieged positions and for further advancing in Deir ez-Zur, which is an oil rich province. Despite the Iranian sources’ claims indicating that 360 ISIS terrorists were killed Fars News Agency, Accessed on: June 21, 2017. seem pretty much exaggerated, both the presence of an Iranian drone over the target area for battle damage assessment and coordination with the Syrian regime forces show a fairly professional planning of the mission. Notably, following the missile strike, Iranian outlets reported the Assad regime’s follow-up offensive in Deir ez-Zur province and adjacent areas. Fars News Agency, , Accessed on: June 21, 2017. Furthermore, the information operations aspect of the missile strike also reflects coordination between the Iranian Revolutionary Guards and the Syrian Baathist regime. In this respect, amidst the discussions about the operation’s success, pro-regime social media accounts shared videos of Iranian drone footage showing four missiles out of six hitting their targets. https://twitter.com/WithinSyriaBlog, Accessed on: June 21, 2017. Harbingers of Iran’s Burgeoning Precision Strike Capabilities? Displayed by Iran in September 2016, the Zolfiqar missile is one of the numerous derivatives of the Fateh-110, a 610 mm heavy guided-rocket that has been in production since the beginning of the 2000s. Iran has invested a lot in this class, extending its range and increasing its accuracy. Latest versions of the Fateh-110 have a range of around 200 to 300 km delivering a payload of some 500 kg. CSIS Missile Threat, Accessed on: June 23, 2017. In 2015, a new version named Fateh–313, which has an extended range of 500km, was unveiled. Analysts estimated that the improvements in range probably resulted from lighter frame, smaller payload, and better flight characteristics. Jeremy, Binnie. “Analysis: Iran Unveils Extended Range Fateh Ballistic Missile”, Jane’s Defence Weekly, August 2015. In line with the modernization uptrend in the Fateh line, a new member, the Zolfiqar missile followed the Fateh–313 within a year. When it was first displayed, analysts concluded that the Zolfiqar missile was probably an improved Fateh–313 with sub-munitions warhead. Jeremy, Binnie. “Analysis: Iran Parades ‘New’ Zolfiqar Ballistic Missile”, Jane’s Defence Weekly, September 2016. In fact, according to IHS Jane’s’ reporting, the Iranian press sources’ misuse of the multiple re-entry vehicles (MRV) term is the most significant open-source intel that suggested a sub-munitions warhead for the Zolfiqar line. Ibid. The biggest unknown about the Zolfiqar missile is the range–payload equation. Back in 2016, initial estimates about the missile concluded that it was unlikely to have a 500km range (also either 600 km or 800 consistently) with a 500kg sub-munitions payload. Ibid. Yet, the Iranians claimed the missile’s range some 700 km since its entry into service. Jeremy, Binnie. “Iran Claims Zolfaghar Missile has 700km Range”, Jane’s Defence Weekly, September 2016. In fact, the picture might be more complicated. Iranian sources’ reporting for the Zulfiqar missile, especially its 700 km range, has raised eyebrows. Firstly, beyond 500 km of range, a single-stage ballistic missile with non-separable warhead normally tends to be unstable, specifically during the reentry phase. Since Fateh-110 and their derivatives are designed for purely conventional missions –unlike the Scud-derivatives Shahab 1, 2, and 3 When initially developed by the Soviet Union, the Scud line (SS-1b, SS-1c, and SS-1d) was primarily designed for WMD delivery missions, and were mostly tipped with nuclear and chemical warheads. – accuracy is of utmost importance for operational effectiveness. So, to increase the range of the missile, one might expect the Iranian scientists opting for equipping the Zolfiqar with separable warheads, optimizing the missiles for longer range ballistic trajectories. In fact, Iran has been developing maneuvering warheads for the Shahab-3 derivatives, such as the Emad missile. Missile Threat CSIS, Accessed on: June 28, 2017. However, the existence of a separable warhead on Fateh family of missiles is not confirmed, at least through open-source intelligence. An alternative for a separable warhead is to prefer a quasi-ballistic trajectory. The advantage of this trajectory is to maintain the missile within the atmosphere during a longer part of its flight, enabling its guidance throughout the most of its trajectory. A quasi-ballistic missile can conduct evasive maneuvers and achieve better accuracy by using GPS data for re-calculating and correcting the flight. Furthermore, slower homing speed of the missile in the final phase facilitates the use of terminal guidance technologies. Typically, and contrary to more traditional old generation short range ballistic missiles, modern heavy guided-rockets are specifically conceived for this kind of trajectory. Current versions of Fateh-110 (and consequently of Zolfiqar in all likelihood) are described as quasi-ballistic systems. But in this regard, considering the Zolfiqar case, increasing the range up to 700 km would probably require a major modification to give the missile a better lift-to-drag ratio. Besides, such a modification would necessitate intensive testing, and possibly, improved propulsion. Although this possibility raises particular concerns about Iran’s level of technology and know-how, the Zolfiqar missile’s modifications are still unknown. Alternatively, as explained below, the Zolfiqar missile might have a more limited range and may be considered as another derivative of the Fateh line, not a brand new capability. But even so, the technological trends behind the Zolfiqar development would still deserve utmost attention. Indeed, they will inevitably transform the very nature of the threat on the battlefield and in the theater. The abovementioned probability analysis of the Deir ez-Zur strike does not necessarily mean that a Fateh line derivative (Fateh-313 or a Zolfiqar) was not used since the distance between Iran’s Kermanshah province (border areas) and Deir ez-Zur is less than 550 km. In case the missiles were launched from the Kordestan province, the flightpath can be reduced to less than 500 km. Therefore, following the assumption that Zulfiqar missiles were indeed used, the Deir ez-Zur strike does not point to Iran having managed to extend the range of its Fateh line well beyond 500 km. After all, the precise location of the missile launch is not known, at least publicly. At this point, the Israeli outlets, reporting the strike range around 800 km, can be dismissed if the missile is considered to be a known Fateh derivative. Otherwise, in an 800 km flightpath scenario, the missile could be either a drastically improved, as yet unseen variant, or a Qiam missile, a liquid-fueled short-range ballistic missile derivative of the Scud-D with a triconic warhead and some 650kg payload. IHS Jane’s, Jane's Sentinel Security Assessment: The Gulf States – Iran Strategic Systems, 2017. However, the accuracy of the Qiam is probably much lower than that of the Zolfiqar, leading to conclude that Qiam missiles were probably not used in such a strike. Because, for Operation Laylat al-Qadr, accuracy was the most important parameter which made the Zolfiqar missile the weapon of choice. Further questions revolving around the range of Zolfiqar missiles are also notable. Extending the range of the known Fateh-110 derivatives more than 130%, especially if the payload is not significantly reduced, would necessitate the intensive use of light materials, as well as drastic improvements in the propellant. Probably, current variants of the Fateh line use composite propellant, which already marks a significant evolution from the early versions introduced in the early 2000s. Those were believed to be propelled by double-based propellant. Double-based propellants are basic solid-fuel systems. Composite propellants, which are much more energetic but complex, points to the growing sophistication of the Iranian industry, chemical expertise, and modelling. The continuing extension of the Fateh’s range, assuming that the Zolfiqar missile is the peak point of the line – even at lesser ranges than expected – may prove that Iran is now able to upgrade the efficiency of its composite propellant through the growing qualification of its engineers and sophistication of its industry. While it is not certainly confirmed that the Zolfiqar is a quasi-ballistic missile with some 600 – 700km range, still, this probability cannot be fully disregarded. The main advantage of a quasi-ballistic trajectory is to enable maneuvering of the missile, increasing its accuracy, and also deceiving missile defenses that are optimized for countering ballistic missile threats. This trend has already been followed by several missile powers. In this segment, Russia, with its SS-26 Iskander, For detailed info about the Iskander missiles, see: Stefan, Forss. The Russian Operational-Tactical Iskander Missile System, Finland National Defense University, 2012. is clearly leading the way. India, with the Shaurya missile, is currently exploring this technology. All these systems can also engage in terminal maneuvers when closing to their targets. Therefore, the conception of similar systems by Iran, using the Fateh line, should be taken into consideration. Iran is confronted with massive missile defense deployments by its regional competitors and lacks high-end inertial navigation technology. It is thus unable to significantly reduce the inaccuracy of its ballistic missile arsenal, even at shorter ranges. Hence, Iranian defense planners have opted for initiating research activities that focus on maneuvering technologies both for long range (i.e. the Emad missile with a -maneuverable re-entry vehicle) CSIS Missile Threat, Accessed on: June 23, 2017 and short range systems (i.e. the Fateh line, with quasi balistic trajecotries or terminal maneuvers). While most of the studies analyzing Iranian missile trends tend to focus on longer range ballistic trajectories and separable, maneuvering warheads, Iran’s shorter range quasi-ballistic guided-rockets and missiles pose a real threat especially in geographically smaller theaters of the Middle East. Moreover, these systems’ several advantages over traditional missile defenses broadens Tehran’s military options. What Iran Can Learn from the Deir ez-Zur Strike? Without a doubt, the strike on Deir ez-Zur will provide Tehran with important lessons learned. Indeed, it may bolster Iran’s strategic operations, confirming that long-range conventional strikes are technically feasible with existing technology. Using maneuverable systems more frequently for such operations, as well as increasing the range of these systems, would pave the ground for breakthroughs in Iranian offensive missile options. At this point, in light of the discussions hitherto, a key question should be answered: did the Iranian (Zolfiqar) missiles manage to precisely hit their targets? To have a clear idea about the actual outcomes of the Zolfiqar missiles launch, we need a reliable battle damage assessment of the target set, which would primarily depend on imagery intelligence (IMINT). So far, the only tangible piece of evidence available is a video footage, probably obtained by an Iranian drone loitering over the target area. Haaretz, Accessed on: June 20, 2017. Therefore, it remains to be seen how Western and Israeli intelligence agencies will analyze the evidence, and of course, if their analyses will be publicly available. In this regard, the Israeli Defense Forces (IDF) Chief of Staff, Lieutenant General Gadi Eisenkot belittled the strike, indicating that the operational achievement was much smaller than Iranian sources reported. Ynet News, Accessed on: June 21, 2017. On the other hand, so far, there has been no alternative visual evidence provided by parties likely to identify the Iranian missile launch as a possible threat, such as Saudi Arabia, Israel, or the US. Such a move could have rendered Iran’s political signaling and muscle-flexing efforts abortive. Thus, unless an alternative battle damage assessment is presented with IMINT evidence, we can assume that most of the Zolfiqar missiles indeed struck the ISIS targets in Deir ez-Zur. So far, video uploads of the drone footage of the strike already suggests that four of the launched missiles scored hits. https://www.youtube.com/watch?v=p2SYfIoknyo, Accessed on: June 23, 2017. Broadly speaking, Iran is developing a capacity that would allow it to intervene in its neighborhood through deep strike and precision strike capabilities. 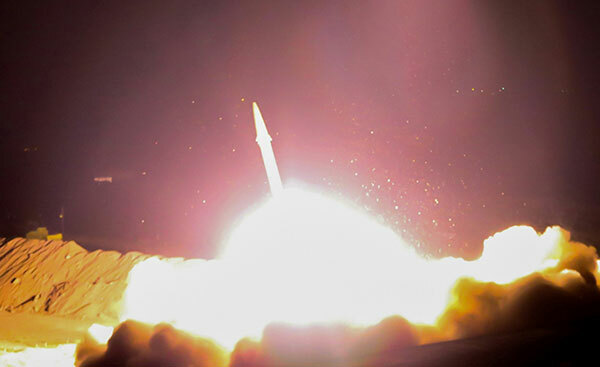 Iranian sources highlighted four key points about the missile strike: firstly, it was carried out by the Revolutionary Guards; secondly, although the strike targeted ‘Takfiri terror outfits’ in Syria, it should also send a message to Saudi Arabia regarding the US’ recent multi-billion dollars arms sales to Riyadh, thirdly, it was ‘medium-range ballistic missiles’ that were used in the mission, As noted earlier, in terms of technical categorization, the flightpath suggests short-range ballistic missiles. and finally, the Deir ez-Zur case tangibly showed Iran’s deterrence capacity. Press Tv, Accessed on: June 20, 2017. In fact, given the abovementioned official explanations, it is argued that the Iranians have been also pursuing political signaling objectives amidst mounting regional fluctuations in the Middle East. In other words, Tehran, specifically the Revolutionary Guards, have conducted their brand of ‘missile diplomacy’ through the Deir ez-Zur strike. For instance, Iran’s Foreign Minister Javad Zarif celebrated the operation by tweeting “Iran's missile capability protects its citizens in lawful self-defense & advances common global fight to eradicate ISIS & extremist terror”. https://twitter.com/JZarif?ref_src=twsrc%5Egoogle%7Ctwcamp%5Eserp%7Ctwgr%5Eauthor, Accessed on: June 21, 2017. Supreme Leader Khamenei’s rhetoric was more defiant, posting “know that they can never bring us down, but that we will bring them down” with a Deir ez-Zur hashtag. https://twitter.com/khamenei_ir?ref_src=twsrc%5Egoogle%7Ctwcamp%5Eserp%7Ctwgr%5Eauthor, Accessed on: June 21, 2017. By all means, such a course of action seems ‘inspired’ from Russia’s Kalibr cruise missile launches – and show of force – from the Mediterranean and the Caspian in the course of the Syrian civil war. In parallel, the strike is of critical importance for estimating Iran’s current and prospective offensive capabilities. Simply put, the trends in Zulfiqar missiles modernization would give Iran an adequate weapon for covering key US bases in the region, as well as the Saudi capital Riyadh. The Washington Post, Accessed on: June 21, 2017. If the missiles were to be transferred to Iranian proxies, first and foremost the Lebanese Hezbollah, then Israel will have to face a grave national security threat. The transfer of early Fateh-110 variants to Syria, and presumably to Hezbollah, is already considered an existing challenge by the Israelis. Finally, the Deir ez-Zur strike could mark the need for revisiting the effectiveness of the missile defense architectures and related strategic thinking of the Gulf Arab nations, as well as the US. Although maneuverable missiles can be intercepted, current missile defense architectures deployed against Iranian missiles are not precisely adapted to the evolving characteristics of the threat itself and better fitted to engage Scud-based ballistic missiles. In this respect, being lighter, more mobile, much more accurate, and cheaper than old Scud-based missiles, the Fateh line challenges the traditional missile defense paradigm in the Middle East. In case Iran opts for transferring the Fateh-line derivatives to the Houthies in Yemen, this risk may be operationally demonstrated. All in all, the Syrian civil war offered a war-time testing laboratory for the regime’s Scuds, the Russians’ Kalibr cruise missiles, and recently, the Iranian Revolutionary Guards’ Zulfiqar ballistic missiles. The Iranian missile strike was a milestone in many aspects. Drastic sophistication of the Fateh family of missiles can be translated into a clear battlefield advantage for the Iranians at tactical and operational levels, especially when employed in salvo launches. Furthermore, the Fateh line, including Zolfiqar missiles at the highest-end, are road-mobile, have short launch-cycles, and might be produced in high quantities which confer additional tactical advantages. The modernization trends from the Zelzal rockets to Fateh-110, Fateh-313, and finally to Zulfiqar missiles hints at what might come next in Iran’s solid-fuel ballistic missile inventory. The expertise gained in solid-fuel designs could be partially translated into the development of more sophisticated and longer range solid-fuel missiles, such as Sejjil–2 type missiles with some 2,000km range and potentially more. Which guidance, propellant, and missile design advances enabled the recent Zolfiqar developments? Was there key technology and know-how transfer to Iran that boosted its solid-fuel short-range missiles program recently? If not, to what extend Iran’s national R&D and industrial capabilities are able to sustain such missile programs? Is Iran able to develop such technologies alone, or mostly alone? If so, what kind of impacts are to be expected in terms of proliferation of shorter range systems in near future? In a broader sense, what would be the operational impacts of the abovementioned trends on Iran’s neighbors and their military modernization programs? In fact, without finding accurate answers to the abovementioned questions, considering Iran a merely proliferating state, which is unable to progress without foreign assistance, could be a dangerous mistake with high costs. More importantly, one should re-think the biggest question about the Iranian missile developments: what comes next?